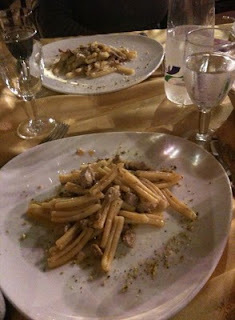 We recently visited Sicily for the first time and I was happy to find a dish I had never heard of before, Pasta alla Norma. I don't think I would have ordered it except I saw it on every menu and got curious. I was pleasantly surprised to find this dish delicious whether with pasta or even with pizza. And in case you are wondering why I was eating pizza and pasta, the European gluten does not seem to affect me the same way as it does in the US; I might have to move! Eggplants, which are prevalent in Sicily, are used in dishes like caponata and pasta. Pasta alla Norma is a dish you can find almost any where there but was originated from Catania, a city on the eastern coast of the island. 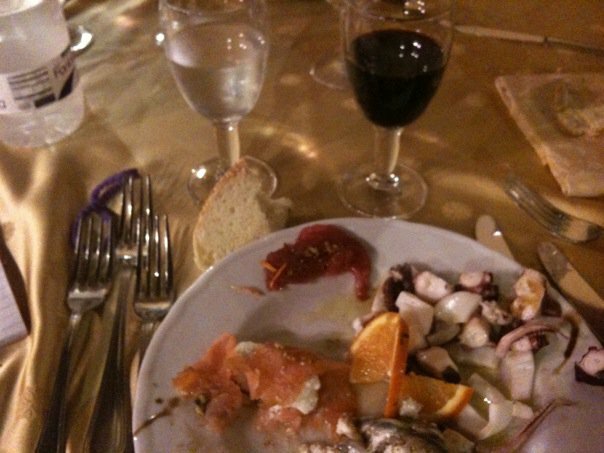 Nino Martoglio, an Italian writer and poet, was so enthusiastic with this dish that he compared it with the awe of the opera Norma, written by catanese composer Vincenzo Bellini. If you like eggplant parmesan, you might say the same thing. 3) Add the sauce and cheese to the pasta. If you don't wish to make the sauce from scratch, use your favorite pre-made variety. It's the combination of the flavors that really make the difference. I would also suggest making a double batch of the sauce and using half for this dish and half for later. For a gluten-free version, just switch your pasta to gluten-free. You can also make Pizza alla Norma by adding fried eggplant to your pizza along with some extra sharp cheese. So, either way, make a batch, open a robust red wine, sit back and enjoy. 1. Fry eggplant in a saute pan in 1 Tbl olive oil until brown on each side. Do this in two batches. Alternatively, roast eggplant in the oven. Place eggplant coated in olive oil on a baking sheet in the oven at 400ºF for about 20 minutes. Once cooked, put eggplant aside. 2. In a medium pot, add 1 Tbl oil. Add garlic and cook for 2 minutes. Add tomato, paste, salt, pepper, and sugar. Cook for 30 minutes, simmering, stirring occasionally. Add basil and eggplant at the very end. Cook 3 more minutes. 3. 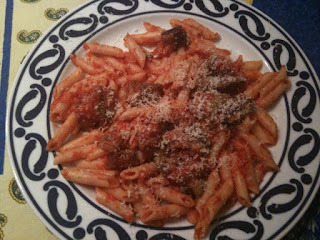 While the sauce is simmering, cook pasta according to directions. 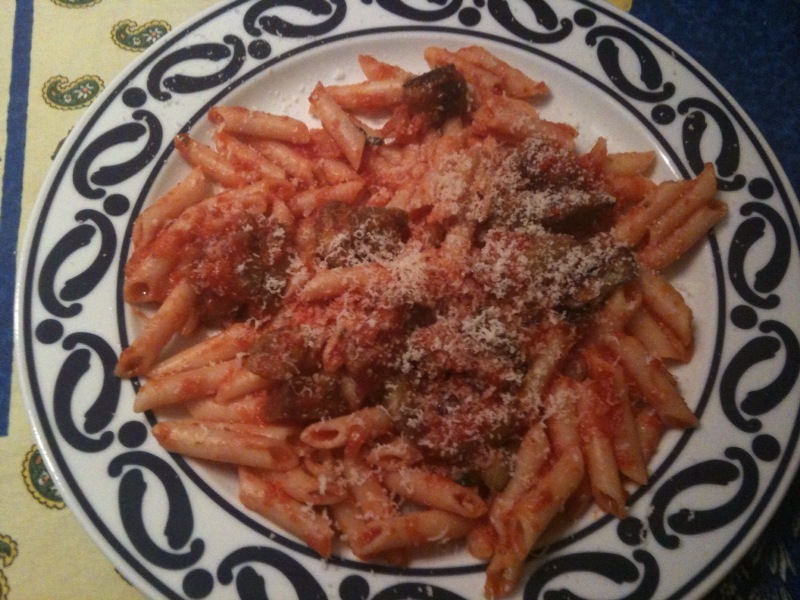 Always save 1/2 c pasta water in case the sauce is too thick to help loosen it up. You may only need 1-2 Tbl of water but it's better to have more on hand. 4. Serve pasta with sauce and top with cheese. If sauce is very thick, see step 3. When you travel with children, especially between time zones, you might have to make adjustments to your routine. After taking a couple of trips with my young kids, I've learned a few things that hopefully can help you. When the kids were very young and we traveled to a destination with a 7 hour or more time zone difference, we found ourselves up at 2am, playing trains and legos. As they got older, we learned the importance of the time zone adjustment. One way to do this is to schedule an early flight. Although a 6am flight may seem ridiculous, waking our kids up at 4am was the beginning of the adjustment. On a red-eye flight, try to make sure they sleep. We always bring pajamas as well as their "stufties" (stuffed animals). This along with a blanket and pillow helps a lot. When we arrive at our location, keeping them awake is key. This last time we all had to take an afternoon nap which only lasted 2 hours but was necessary. Then, instead of an 8pm bedtime, we tried 11pm. This seemed to work well. Within a few days, we were all functioning rather well. When you have young children (under 6), it's not the best strategy to see 3 tourist attractions in one day. If your kids are cranky and uncooperative, especially if they are a bit jet lagged, you won't be having any fun either. If you traveled before you had kids (when you were younger and had more energy), it's going to be much different now. It would be a good idea to not over schedule and even have some down time or days. It's important to find a park or an open space where children can run around and get out their "crazies". For Food, Adopt "Travel Rules"
Although at home, we are very strict about making sure they eat vegetables, not eating too many sweets and not drinking soda, when we travel, we are much more relaxed. 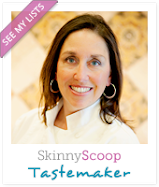 When you are eating out 3 meals a day, it's not that easy to keep up the same standards. You know your children best. I have found as they get older, it's easier to stick to some of the rules but some times, you have to be flexible. 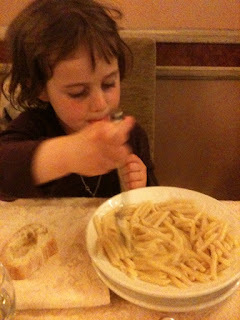 Although normally I would insist my daughter eat vegetables every day, she survived on a lot of pasta and butter this past trip. As her parent, I know when I can push her and when I can't. Instead of getting into a battle with her (which I know I would not win), we compromised by saying she had to eat her regular food when she got home, like carrots, broccoli, lettuce, apples and strawberries. After making the connection with how food can affect how you feel, especially when you are in the bathroom (hopefully that's not TMI), she agreed as well. She's already back to her routine. Although my husband drinks it, our children don’t get a lot of soda, unless it’s on a trip or a special occasion. I watched my son, drinking soda through a straw out of the corner of his mouth, come alive like a dehydrated flower that has been watered for the first time in days. Within minutes, he was awake. As I had said, a successful trip has much to do with the expectations. If I expect my children to behave as they do at home or eat vegetables with every meal…well, I might not have such a good time. I let all of that go. As long as they had some fruit each day and ate a meal before gelato, I just didn’t care. On our trip, they ate lots of bread and drank juice and soda. Instead of negotiating, I just said “Ok”. The combination of letting my standards go a little and keeping my expectations below the norm led to a very satisfying vacation which will be carved in my memory as a pleasant experience.